Magtech has your answer for .380 ACP ammunition for range practice and plinking out on your land. Each round is reloadable, has a brass casing, boxer primer, and non-corrosive propellant. 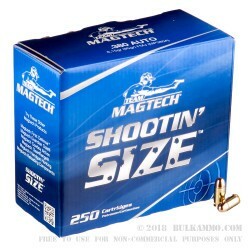 Magtech shooting sport round and is an excellent brand of economic, low cost target ammunition. Each cartridge is assembled using only quality components and strict quality control standards at every stage of the manufacturing process. The result is excellent, affordable ammunition that delivers the performance you require time after time. Magtech is parented by Sellier & Bellot, who established themselves in the game back in 1825. Sellier & Bellot then established CBC in 1926, and Magtech in 1990. Magtech is commercially recognized internationally and sold in more than 50 countries worldwide. 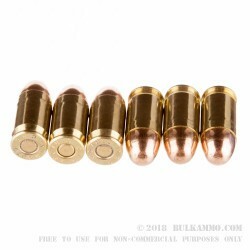 Their objective is to provide affordable, reliable ammo for shooting enthusiasts round after round. It is designed, constructed and tested in one of the largest and most modern small arms manufacturing facilities in the world. Only the best quality materials, cutting-edge manufacturing and engineering and state of the art equipment are used to deliver their exceptional products. Strict quality control standards are met in accordance with SAAMI, CIP, NATO or US Mil spec to ensure safety, consistency and reliability.